That is not only a vampire, but it's the third coolest vampire ever. After Alice and Edward. 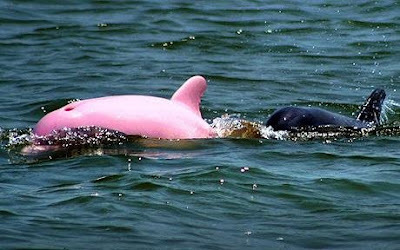 i think this pink dolpin is prtty weird, but whats that thing next to it?! but i would love to be a vampire! Blasted computer! I swear, it has the genius of a rotten potato! It's like an old man. Now the picture is gone! Ah! I loved that albino dolphin! Blasted, crudy computer! anyone care to explain recent obsession w/ vampires? The thing with Twilight is the stupid movie, emphesis on 'stupid'. It's going all popular because of that dude that plays edward in the movie. Let's all take a minute of silence, thinking of nasty names to call him. Calling Twilight 'stupid' is seriously NOT a good idea. Ahem. I'm sorry to say, peace peeps, but you're just another one of stephenie meyer's victims. And you are free to do whatever you want, cause I hate twilight. It's stupid. Ridiculous. And pointless. Dakota Blue and Peace Peeps: Oi, I thought I might actually have found a place in cyberspace that was frequented by those obsessed with Twilight and Stephanie Meyer. (yes, haters are just as bad as rabid fans, only the opposite way). Apparently I was wrong. Please, guys, this is a website for the Kiki Strike books. If you want to duke it out over some other series, could you please find somewhere else in the World Wide Web to do it? Peace peeps, i must saw, the dolphin it beautiful, but i don't like the twilght series at all. I LOVE THE DOLPHIN, BUT I WOULD BUY A TRILLION KIKI STRIKE BOOKS BEFORE I EVER TOUCHED 1 TWILIGHT BOOK. THATS RIGHT, PEACE PEEPS, I DONT LIKE TWILIGHT, NOT TO BE RUDE BUT TWILIGHT IS VERY CHEESY AND DUMB. THX KRISTEN 4 UR AWESOME BOOKS!!!!!!!!!!!!!!!!!!!!!!!!!! back on subject, can we buy a pink dolphin i want one!!!! ANYWAY, BACK TO PINK DOLPHINS!!!! I have to ask, is it a boy or a girl? Hey do u want Edward Cullen to come and BITE YOU rip your guts out of your body he can read your mind like a vampiere twilight is the best best best best best best best movie ever u must b blind to not know dat who ever writ dat comment about twilight being ridulous. i agree 2. go twilight bash somewhere else-im pretty sure there's a website for that.